get advice from bloggers! get good advice! look up duty pharmacies! check your horoscope! give your opinion! explore Luxembourg! follow the pros! find a job! follow bloggers! find the right contact! recommend pros! prospect effectively! chat with the pros! look up emergency numbers! check out what’s on at the cinema! book a table! enjoy savings all year-round! check the weather! check traffic info! find a property! find out about the market! work your network! get inspiration! find a car park! chat with your communities! make doctors’ appointments! 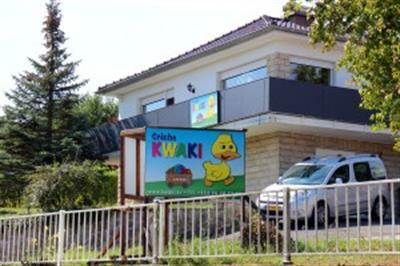 Crèche Kwaki is based in a detached house in Junglinster and has been open since February 2004. It has a very welcoming family atmosphere and offers a bright, welcoming and safe space for the comfort and pleasure of children aged 0 to 4 years. Our crèche is accredited in accordance with the standards in force in the Grand-Duchy of Luxembourg and stipulated by the Ministry of Family Affairs. We are also part of the ‘Chèque-service accueil’ public co-financing scheme. Your children will love our large garden with a wide range of play equipment and toys, plus our spacious field with sheep, fruit trees and large vegetable garden. The children are divided into two groups: 0 to 2 years and 2 to 4 years. They are surrounded by a qualified and dedicated team that has remained unchanged since the crèche first opened. You have the choice between enrolling your child part-time (without meals), three-quarter time (with lunch) or full-time, and all options are possible starting from one half-day per week. Cooked meals made from fresh produce are delivered daily in order to ensure a varied and balanced diet. For babies, we cooperate with the parents to adapt meals according to age or special diets. We organise picnics, birthday parties and barbecues when the weather is fine. We offer and recommend an adaptation period for your child’s first days at the crèche to ease the separation and reassure your little one. Parents are invited to come and meet the team who will take care of their child. Jeux libres pour laisser l’imagination et l’échange de l’enfant se développer. Peinture, coloriages pour développer la création et l’imagination de l’enfant. Crèche Kwaki in Junglinster, full practical information on Crèche Kwaki: opening times, telephone, address. 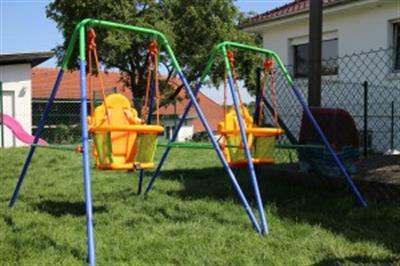 All activities for Crèche Kwaki: Bilingual nursery, Extracurricular, Non-formal education, Nurseries and day center. Locate your contact Crèche Kwaki on a map in Junglinster.